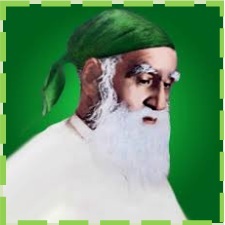 Pir Mehr Ali Shah is awell-known spiritual personalityand an intellectual Islamic scholar of the Muslim world. His love for Allah and his Prophet Muhammad ﷺ was an integral part of his temperament from the beginning. It was due to his love of Allah and his Prophet ﷺ that he was able to achieve higher status of Ma’rifat (Sufism). "Avoid extremes in religious as well as worldly matters, for peace and salvation lie only in following the middle path"
Being a highly ranked spiritual personality, it was his belief that Spiritual elevation does not give any one a license to ignore the Islamic Shariah. Indeed, the higher a person goes on the spiritual scale, the greater should be his observance of Shariah. Similarly he had firm faith that one should carry on one’s legitimate business in life, and should consider Allah at the same time to be omnipresent and All-Seeing. In the light of above mentioned quote, we can see that he had simplified the complicated issues of modern society and it was because of his insight and cognition of the essence of sufism. There are lessons for our youth to follow. Peace and harmony are the basic ingredients to make our society a Nobel and healthy one. However, to promulgate these, the character of a person matters a lot. Similarly, we have lost the element of spirituality in our lives andnowadays it is a dilemma that our young generation has a very little knowledge about the real meaning of spirituality.So, it can be deduced from the above discussion that spirituality provides the base for other three pillars of peace, harmony, character building.